After serving in the Army, Alexander Woollcott went back to the New York Times in the summer of 1919. 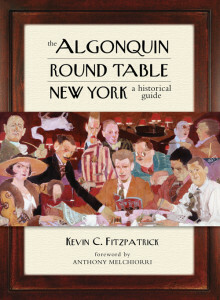 It was a few Broadway publicists that set events in motion that would lead to the formation of the Algonquin Round Table. Now you can journey back there, in time, to a grand city teeming with hidden bars, luxurious movie palaces, and dazzling skyscrapers. In these places, Dorothy Parker and her cohorts in the Vicious Circle at the infamous Algonquin Round Table sharpened their wit, polished their writing, and captured the energy and elegance of the time. Robert Benchley, Parker’s best friend, became the first managing editor of Vanity Fair before Irving Berlin spotted him onstage in a Vicious Circle revue and helped launch his acting career. Edna Ferber, an occasional member of the group, wrote the Pulitzer-winning bestseller So Big as well as Show Boat and Giant. Jane Grant pressed her first husband, Harold Ross, into starting The New Yorker. Neysa McMein, reputedly “rode elephants in circus parades and dashed from her studio to follow passing fire engines.” Dorothy Parker wrote for Vanity Fair and Vogue before ascending the throne as queen of the Round Table, earning everlasting fame (but rather less fortune) for her award-winning short stories and unforgettable poems. Woollcott, the centerpiece of the group, worked as drama critic for the Times and the World, wrote profiles of his friends for The New Yorker, and lives on today as Sheridan Whiteside in The Man Who Came to Dinner. Explore their favorite salons and saloons, their homes and offices (most still standing), while learning about their colorful careers and private lives. Packed with archival photos, drawings, and other images–including never-before-published material–this illustrated historical guide includes current information on all locations. Use it to retrace the footsteps of the Algonquin Round Table, and you’ll discover that the golden age of Gotham still surrounds us. Written by Kevin C. Fitzpatrick, author of A Journey into Dorothy Parker’s New York and Under the Table: A Dorothy Parker Cocktail Guide. The foreword is by Anthony Melchiorri, creator and host of “Hotel Impossible” on the Travel Channel, and former general manager of the Algonquin Hotel.